Bringing together theorists, observers and instrumentation specialists, IAU Symposium 311 provides an overview of the techniques used to measure the masses of stars, gas and dark matter in galaxies, and explores what these mass determinations tell us about galaxy evolution. 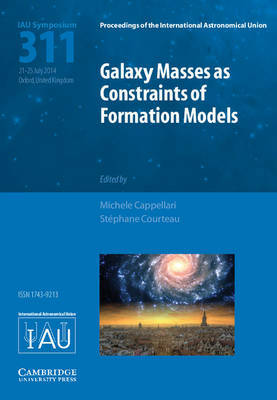 A key advance in recent years has been the enrichment of studies of the luminosity evolution of galaxies with determinations of their stellar or total masses from dynamical analyses using stellar populations, stellar or gaseous dynamical models, and weak or strong lensing. This volume addresses some of the fundamental questions in the field: what key observables can be robustly reproduced by the models? How should existing and new instrumentation be optimized for galaxy evolution studies? And, what future observations would be most useful to constrain the models? IAU S311 offers a valuable insight into this rapidly developing and interdisciplinary area of study, for researchers and graduate students.